Hire a Michael Buble tribute from UK Live Entertainment, and you can be sure that you will be hiring a professional and experienced tribute artist. Every Michael Buble tribute has been tried and tested and has a well-proven track record for delivering quality entertainment and professionalism both on and off stage. Enjoy browsing our roster of Michael Buble tribute choices. We have the top Michael Buble tribute act entertainers available for hire! 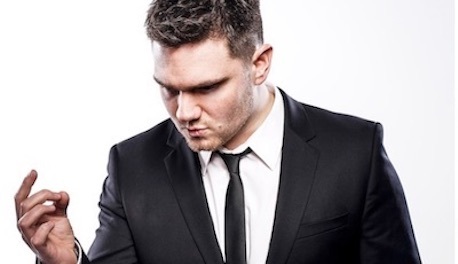 Check out our Michael Buble tribute acts and impersonators and select your personal favourite! All of our Michael Buble tributes are professional entertainers, each of them has considerable live show performance experience, and they have each performed their brilliant shows throughout the UK to critical acclaim and great audience reaction. Our acts have all developed their performances in homage to Michael Buble and present highly entertaining shows which are enjoyed by audiences everywhere. In great demand to perform their shows throughout the UK, they are also regularly invited to perform at venues and events throughout mainland Europe and even further afield too, and can regularly be seen performing at live music venues, hotels, holiday parks, casinos, clubs and onboard cruise ships. They are very popular indeed for private and corporate occasions and events and perform at many personal party celebrations for wedding couples and birthday parties too. All of our acts have totally perfected their impressions impersonations of Michael Buble and with their sound-alike voices and imagery supported by excellent authentic stage costumes and great show production, they deliver first-class show performances of Michales amazing song catalogue and include something for everyone in their song lists. Some of our Michael Buble acts are able to perform their excellent shows with their own fantastic live music backing bands and all of them are able to present their shows solo with their fully produced professional-quality backing tracks. No matter which format you choose to book, you can be assured that our acts will always sing 100% live. And many other great songs too! Special song requests are always welcomed by our acts, who will do their best to sing any particular Michael Buble song that you would like them to perform, however, specific song requests must be advised in advance. Our acts are always keen to add new Michael Buble song material whenever it becomes available, and also constantly update their show costumes to reflect Michael's own stage wardrobe so that they always keep their acts right up to date and in tip-top form! UK Live Entertainment has an enviable reputation in the events entertainment industry for its excellent roster of carefully selected artists and for the excellent and attentive customer service we provide. In addition to tribute artists, we also represent many of the countries very best live music bands, classical event musicians, and general entertainers for venues, parties, festivals, functions, and event. All of our bands, entertainers, musicians and acts, are handpicked by us and they all meet the high standards of performance, talent, presentation and professionalism that we are known for. Hire a Michael Buble Tribute Act Now! Hire one of our Michael Buble tribute act performers now, and you can be certain that you have hired a top quality professional entertainer who will perform an amazing show and leave your audience or guests in awe! Live-Chat with us or telephone us today for free advice regarding suitable entertainers and musicians for your venue or event, we're always here to help and would love to assist you in selecting the perfect entertainment that will help to make your event stand out from the rest!